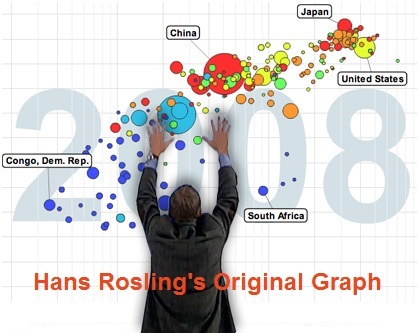 As we're approaching the anniversary of Hans Rosling's passing, I fondly remember his spectacular graphical presentations comparing the wealth and health of nations around the world. He certainly raised the bar for data visualization, and his animated charts inspired me to work even harder to create similar visualizations! What better way to honor his legacy, than to try and re-create one of his animated graphs! ... So let's get started! But my data points don't appear to be spread out like they are in Hans' graph. Most of my data points are squished against the left side of the graph (very low income), whereas Hans' data points visually fall along a diagonal across the graph. Upon closer examination of Hans' plot, I notice that he used a logarithmic axis scale. The log scale spreads the data out more, so you can see more detail. 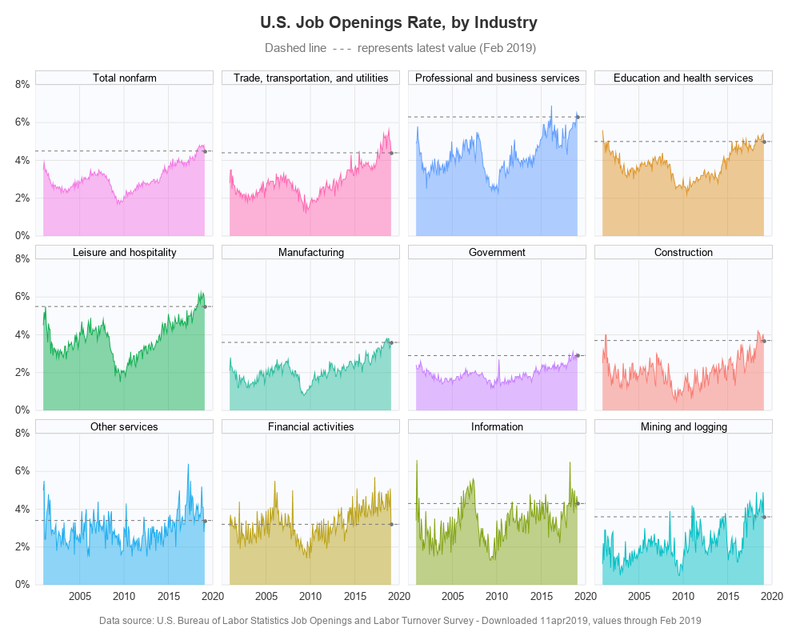 This can be useful, but people viewing the graph need to know that a log scale is being used, therefore it is important to show minor tick marks or minor grid lines with a log axis. I added an xaxis statement, and specified the following options to get a log axis scale, with minor tick marks and grid lines. Now my data points are laid out more like Hans' graph. Next, let's tackle the big year label in the middle of the graph. When I create a plot 'by year', SAS automatically adds a title above the graph, to indicate the year. But I want the year to be really big, and behind the plot markers. Therefore I use 'options nobyline' to suppress the default year in the title, and I add the following 'text' statement to have sgplot add the year in the graph itself. I specify the size as 160pt (so the text is very big), and I add this text statement before the scatter statement so it is drawn first, and layered 'behind' the plot markers. The legend is a bit 'wordy' (which makes it time-consuming to read, and it takes up a lot of space), therefore I decided to use a color-coded world map as the legend instead. I used the 'noautolegend' option to turn off the default legend, and then I created the map using Proc SGMap, and annotated it into the bottom/right corner of the graph (using the 'sganno=' option to point to the annotate dataset). Hans had labels on the bubbles for certain countries. 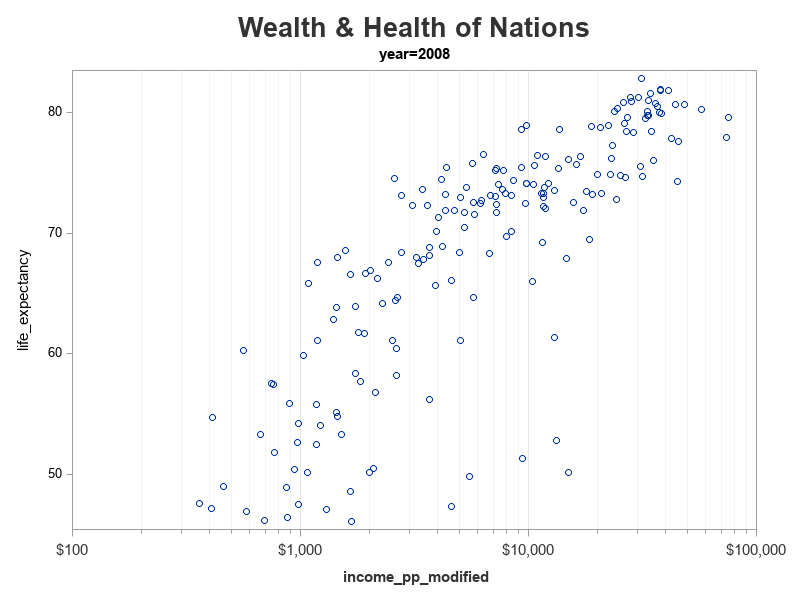 To accomplish that in my graph, I added a variable called 'labeled_countries' to my dataset, and only assigned the country name to that variable for the countries I wanted to be labeled (the variable has a 'blank' value for all the other countries). 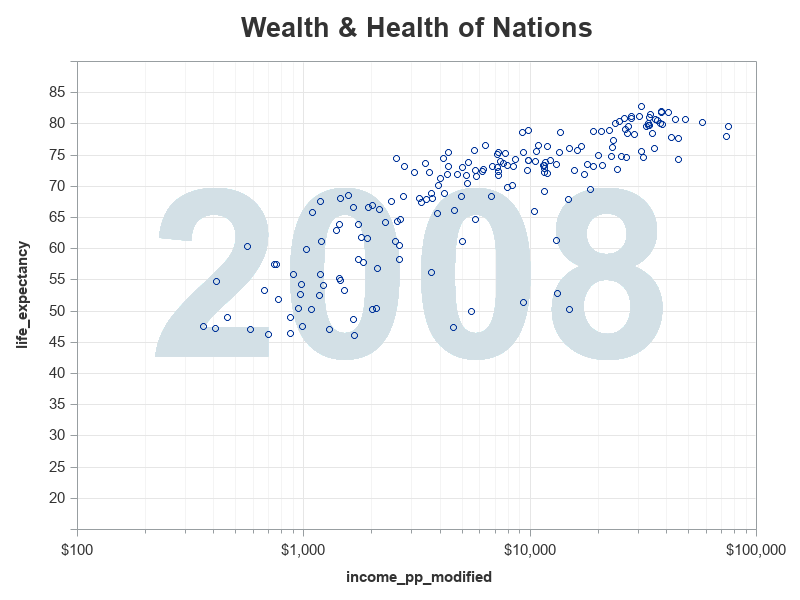 Then I used the datalabel= option to turn on those labels in the graph. We're almost there! - Now for just a few little enhancements to the text outside of the graph. I use label statements to add more descriptive text along the bottom & left axes. I annotate a footnote in the bottom/left (so it will occupy a little less space than using a footnote statement). And I used styleattrs backcolor=cxcedce3 to set the background color. Then there's one slight data deception I need to take care of. 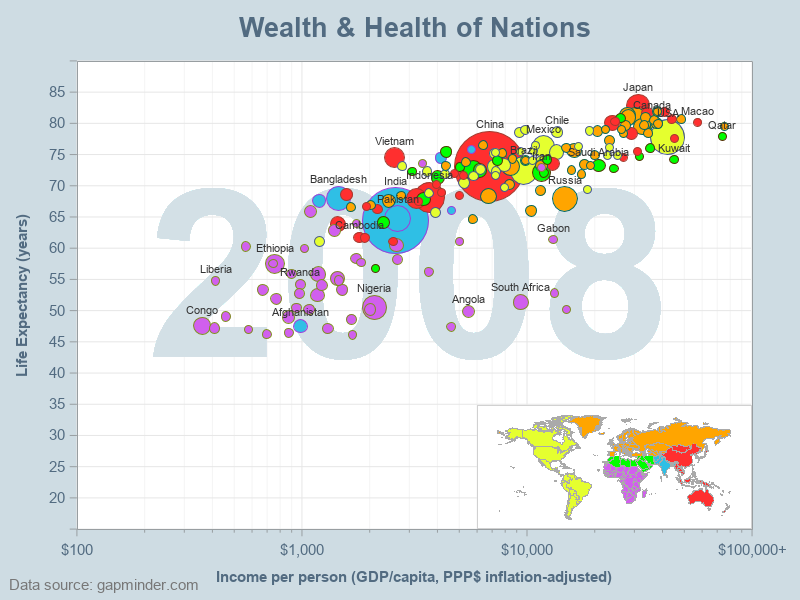 In certain years, the income per person was actually higher than $100,000 ... but my graph axis only goes to $100,000. I still wanted to somehow show those few values that are past $100k, but I didn't want to increase my axis to the next log increment. 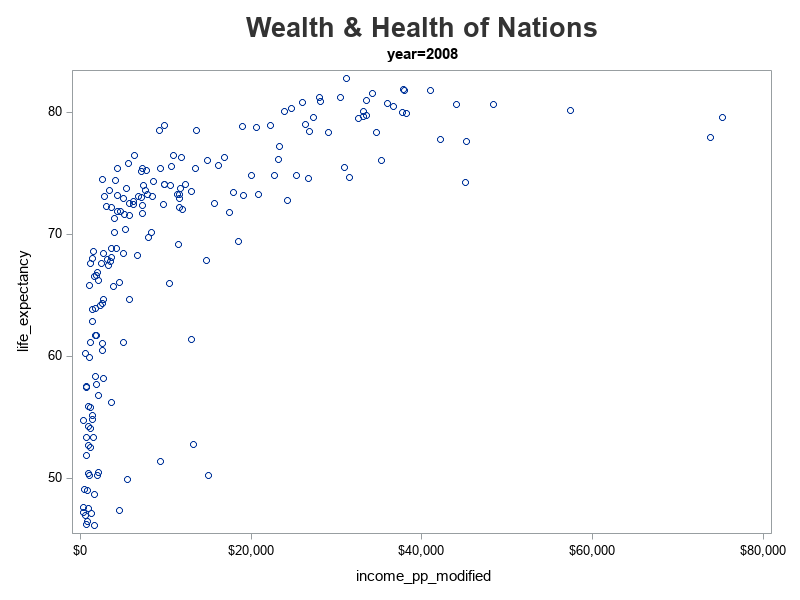 Therefore I set the >$100k values to $100k, and I modified the axis to say "$100,000+". How did I change the value displayed in the axis? - By using a user-defined-format! What about animating the graph over several years? All I had to do was add a few more SAS commands, and instead of the 'by year' creating a separate graph for each year, it combines them into a gif animation! Here's a link to the complete code, if you'd like to see all the details. The animation file is too large to upload into the blog (3MB), but here's a link to see it separately. 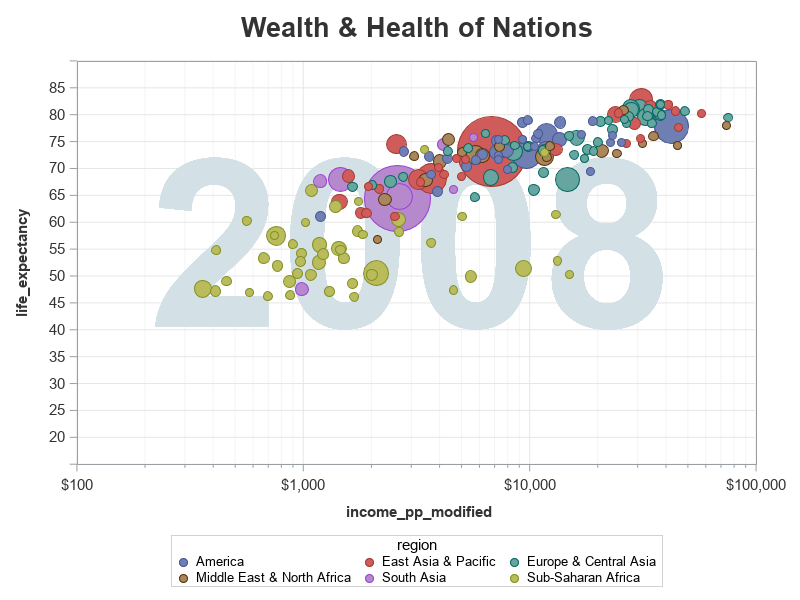 Appreciate your sharing the SAS code to reproduce the world population growth animation. Fantastic work. also the chart for each county in the USA. This article was posted in 2013 using SGPLOT procedure. 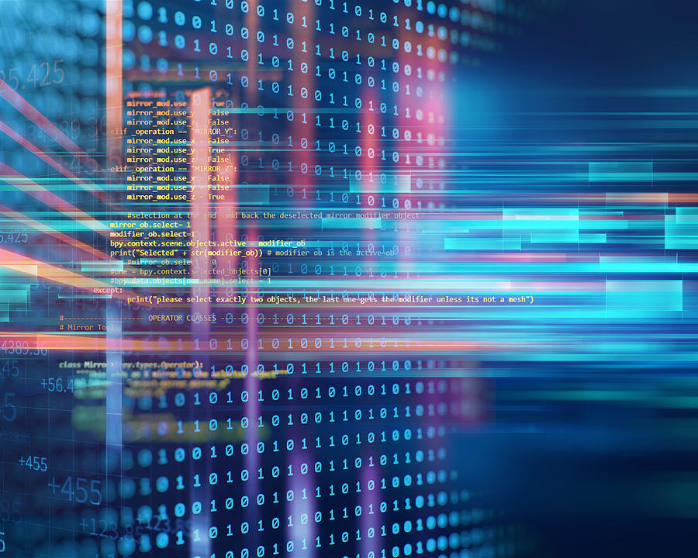 With SAS 9.4M5, program can be improved. 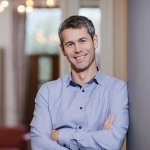 Could be possible to upload the data robsdata.gapminder_data ? Wow, this is great. Which spreadsheets did you download from Gapminder? I’m trying to recreate this for our internal users group. I had to comment out the line below from the proc sgplot. 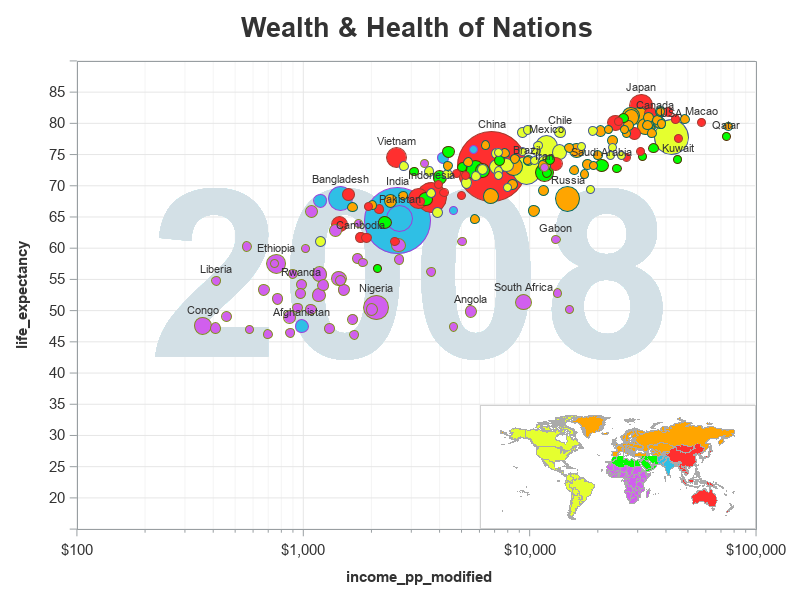 Is there a link to the wealth_and_health_map.sas script? Thanks. We don’t have sgmap yet (vM6) but I think I can do this with gmap.